Studio wizard Daniel Lanois has designed echo-saturated soundscapes for the likes of U2 and Bob Dylan. On Neil Young’s latest oeuvre „Le Noise“ he is collaborating with another gargantuan figure in Rock’n’Roll. The intense old man in front of the stage-lit bay window is doing what he does best in life and what he does with an intensity hard to find anywhere else in his business these days. The man is Neil Young, the business is Rock’n’Roll and what he does is singing his own mesmerising songs in that unmistakable shakey countertenor of his that doesn’t seem to have gone rusty since he first stepped into the spotlight with the legendary Buffalo Springfield in 1966. Having blazed his very own trail through the timber of pop history in that hardheaded and softhearted way of his, Neil Young has joined, left and reluctantly rejoined supergroup CSN(&Y), godfathered heavy electric grunge with his often neglected yet ever faithful band Crazy Horse and recorded one of the most prominent American folk albums of all time (Harvest) in 1971. 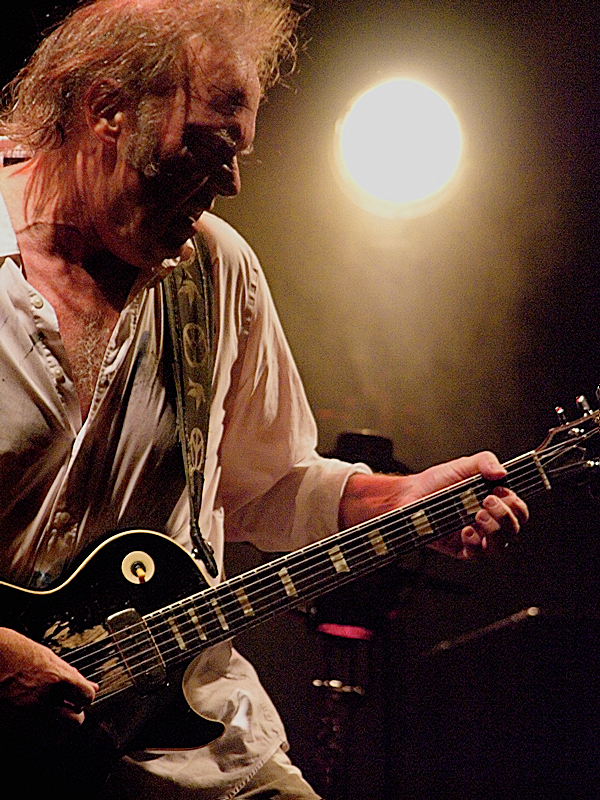 The now 64-year-old Canadian experimented with such diverse genres as swing and electronic music in the 80s, nicked Pearl Jam from Eddie Vedder for an album (Mirror Ball) in 1995 and has since matured into an indispensable elder statesman of the counterculture, comparable to the likes of Bob Dylan, Paul McCartney or Keith Richards. Back to the bay window: As the recording tapes roll and Young is singing his idiosyncratically poetic lyrics, swaying back and forth like a prancing grizzly bear and grinding along with his trademark clawhammer picking technique on a selection of acoustic guitars, Gretsch White Falcons and his battered main axe Old Black (a 1953 Gibson Les Paul with an unorthodox array of pickups and a very old school Bigsby whammy bar), a sly and attentive man in a tailor-made black leather jacket is looking on. Certainly not confined to style in dress alone, fellow Canadian producer Daniel Lanois (59) has lent his talent as a creator of wide open, echo-saturated soundscapes to projects like Brian Eno’s On Land and Apollo, U2’s Unforgettable Fire, The Joshua Tree and Achtung Baby, Peter Gabriel’s So and Us, Bob Dylan’s Oh Mercy and Time Out of Mind (Three Grammys and Album of The Year 1998) and the soundtrack for Wim Wender’s Million Dollar Hotel. After Young went back home to his 1500-acre ranch Broken Arrow south of San Francisco, Lanois started extracting sounds and special words, filtering, delaying and generally putting his sonic wizardry to the material. 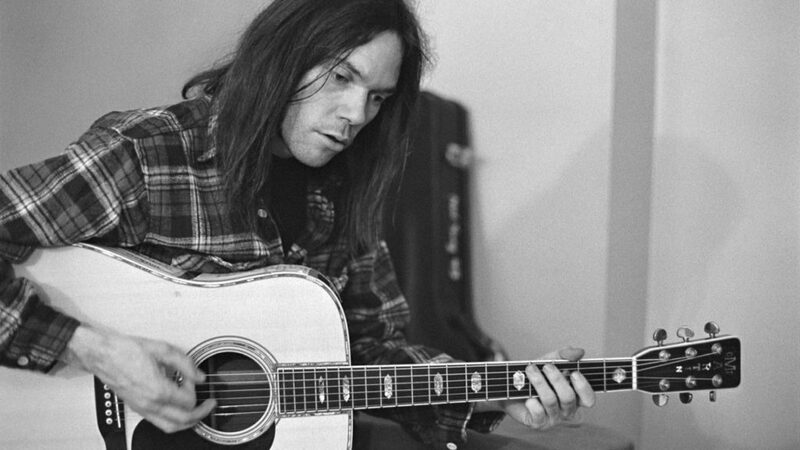 When the mixing was finished, it was clear that another epic Neil Young record would be out by fall time. Take the track Hitchhiker for example, a narcotic confessional of a Rock’n’Roll life lived on the edge, redeemed and healed only by the love of wife and family: classic acoustic Neil Young, just like the vulnerable archaic Love and War with its gorgeous Spanish guitar figure and the throbbing, fuzz-driven Angry World, a song that was triggered by a conversation with a frustrated fisherman, who had lost it all during the Exxon Valdez oil spill in 1989. The album could end with the dreamy, arcadian Peaceful Valley Boulevard, but it wouldn’t be a Neil Young album, if there wasn’t a song as unexpected and unsettling as Rumblin’, taking the listener out of this worthwhile and all-out sonic experience. 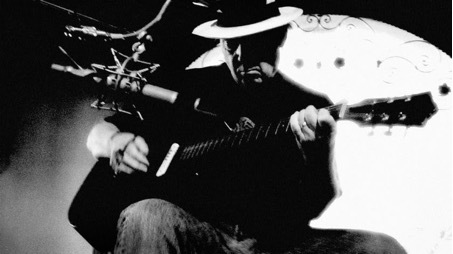 Check out the most comprehensive Neil Young site thrasherswheat.org and watch the movie covering the recording session here.